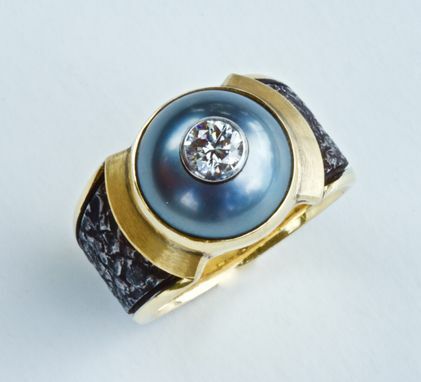 This stunning ring has a fabulous 12mm, black south seas pearl, that I cut in half and drilled to set a .35ct diamond that is VS clarity, and H in color. The diamond is set in a platinum bezel. The 14mm wide ring is made with 18kt royal yellow gold and durable forged stainless steel, and this rings in the finger size 81/2. This ring is a master piece!